KIEV, Ukraine -- More than two million people are now refugees or internally displaced due to war but their plight is little reported. Oksana Korchma, 45, is a foster carer. She takes care of 10 children, out of which, seven are adopted. 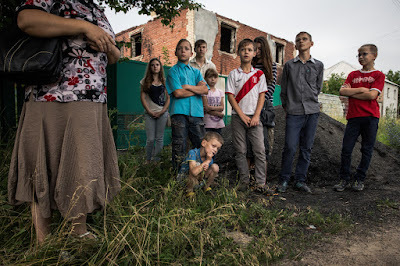 On July 2, 2014, three days before the city of Slavyansk was recaptured, her house was burned. "We were in the basement, hiding from the shelling and we did not understand the house was burning. It's a miracle that we are alive!" said Korchma. "All our belongings were destroyed. We don't have bed linen, we don't have a fork, we don't have a spoon". Natalya Beskorovana’s words condense the everyday reality of the majority of Ukrainian refugees or internally displaced (IDPs) hard hit by the conflict in the country. While the fighting in Ukraine is placed in a sort of quarantine in the East, life in other parts of the country is moving along almost undisturbed. Peace and war are enjoying a more than strange cohabitation, so the true impact of the conflict is far from obvious. At the end of June 2015, one year after the fighting started, there were more than 1.35 million internally displaced people in Ukraine, ranking the country ninth worldwide in terms of IDPs. There are also more than 900,000 refugees in neighbouring countries and the estimated number of people in need of humanitarian aid is now five million. People face shortages in food, health services, shelter and medicines, which are in worryingly low supply In Ukraine. In order to receive IDP status, and thus be eligible for some benefits from the state and humanitarian organisations, people need to register with the Ukrainian social protection department. The process is lengthy and faces many challenges, like short distance displacement where people move from their destroyed home, but because they do not leave to a different administrative area than the one specified on their ID, cannot become IDPs. Another is when the conflict moves: there are areas around the frontline which the government does not recognise as territories under rebel control and therefore does not include in the official decree stating the towns where IDPs are originating from. As a result, people fleeing from these areas cannot receive the status and benefits. This is also the case for students and unaccompanied minors, who cannot register without the presence of their legal guardian. "Of course we need more help; we hope for displacement benefits as now we are really in need," says 32- year-old Oksana while waiting in line for humanitarian aid at the UNHCR distribution centre in Kramatorsk. "As for money for the children, we have applied to the court to admit Maxym, her three-month-old boy, as a citizen of Ukraine, as he was not born on Ukrainian territory." Oksana gave birth to her child in her home town of Kirovske, in Donetsk Oblast, just before fleeing the city. She found out she was pregnant when she felt sick the first time they had to hide in the basement because of the shelling. Many Ukrainians decide not to leave for safer places because they have a job, which is their only possibility to have some income. As a result, some stay but send away their wives and children. And those who do leave, families that have often lost everything, find themselves in unknown places and in a dreadful limbo, constantly thinking whether to start a new life from scratch, or to wait for the chance to return back home. "I want to go back," says Julia Lomakina, a 39-year-old IDP from Donetsk. "But the only case in which I could go back to Donetsk after the war is over is if it is still Ukrainian territory. In that case, yes, I will return home." Many of those displaced feel that the Donetsk and Lugansk regions should continue to be part of Ukraine. But for other people, the fighting has gone for so long that they end up saying that it's not that important anymore. "Of course we want to stay in Ukraine. We were, are and want to be Ukrainians," says elderly Halea from Avdiivka, who lost her husband after his health deteriorated due to the shelling. "But we just want peace and if it will be different, it does not matter, because we just want to have bright blue sky and no shelling. I want to go back home, not to Russia, but home."